There are a few new reports on the U.S. economy worth mentioning today. 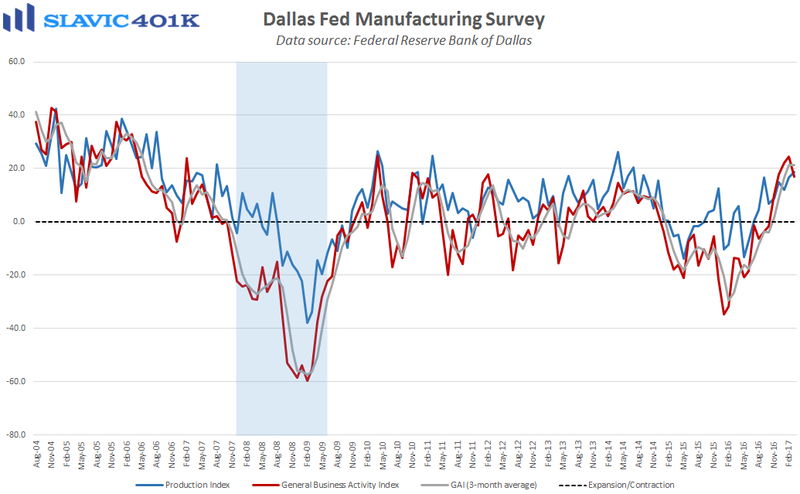 First, data from the Federal Reserve Bank of Dallas showed that business activity in the southern region of the country expanded at a slower rate this month. Specifically, the general activity index slid from +24.5 to +16.9 in March, a larger pullback than expected from the nearly 7-year high hit in February, and the weakest headline reading since November. 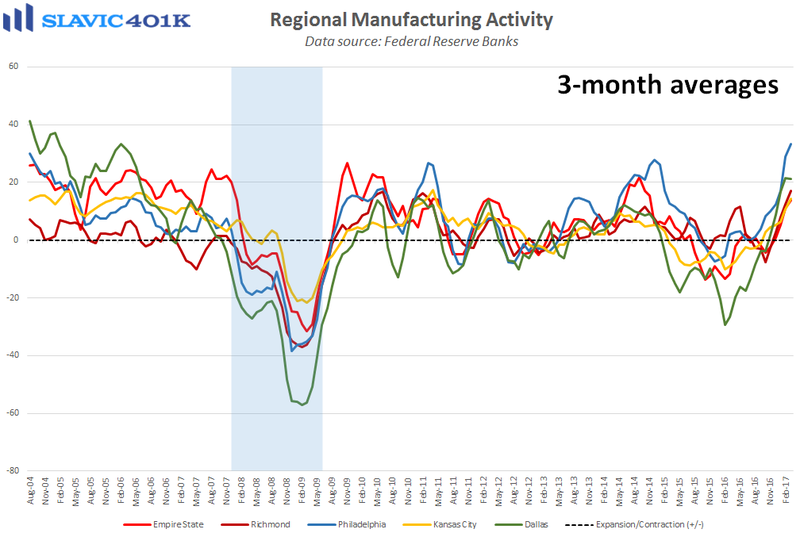 Under the hood, measures of production, hours worked, and employee compensation improved this month but gauges of new orders, capacity utilization, shipments, margin strain, total employment, and capital expenditures all deteriorated. On the bright side, the production index, a key measure of state manufacturing conditions, rose in March to the best level since July 2014. 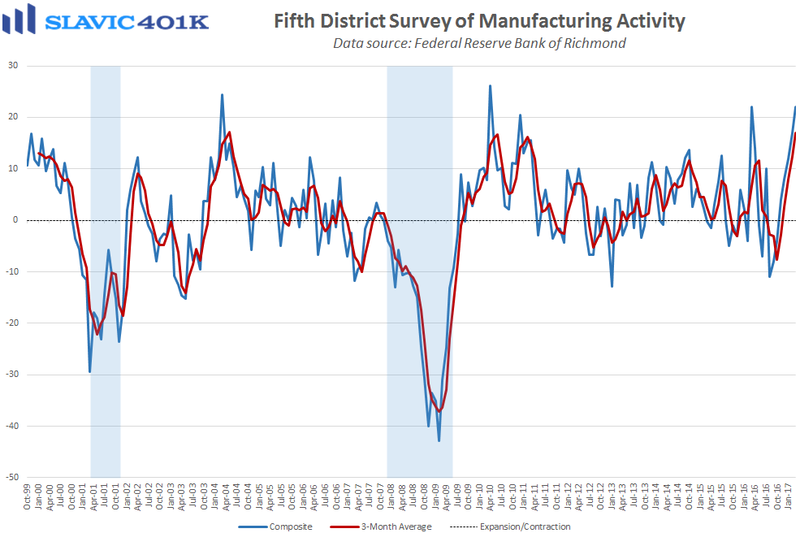 Comments from surveyed managers were generally positive, although one respondent stressed that “stronger expectations are a function of President Trump being successful with his plans.” Slightly more encouraging was a report from the Federal Reserve Bank of Richmond, which showed that manufacturing activity in the Mid-Atlantic region of the country expanded at a faster pace this month. 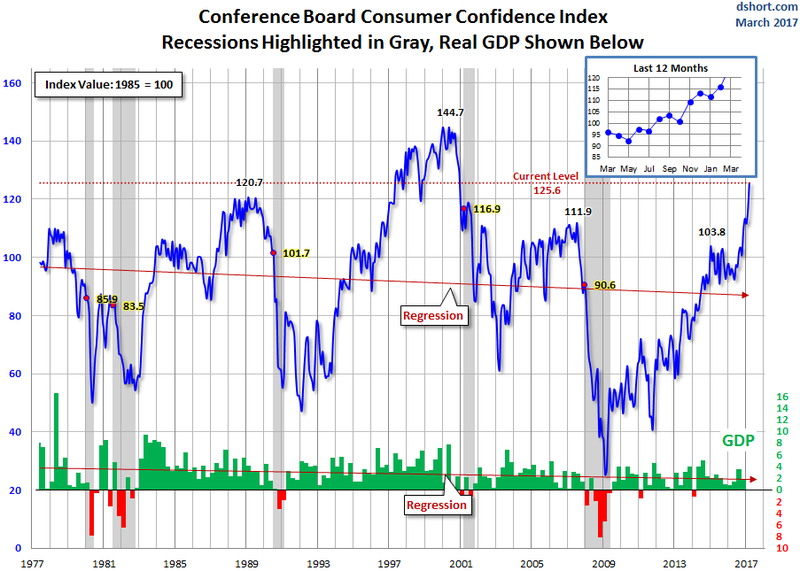 Specifically, the composite index jumped to +22.0 in March, significantly better than expected and the highest reading since 2010. Measures of shipments, new orders, order backlogs, capacity utilization, total employment, hours worked, and wages all improved this month but capital expenditure plans over the next six months declined. 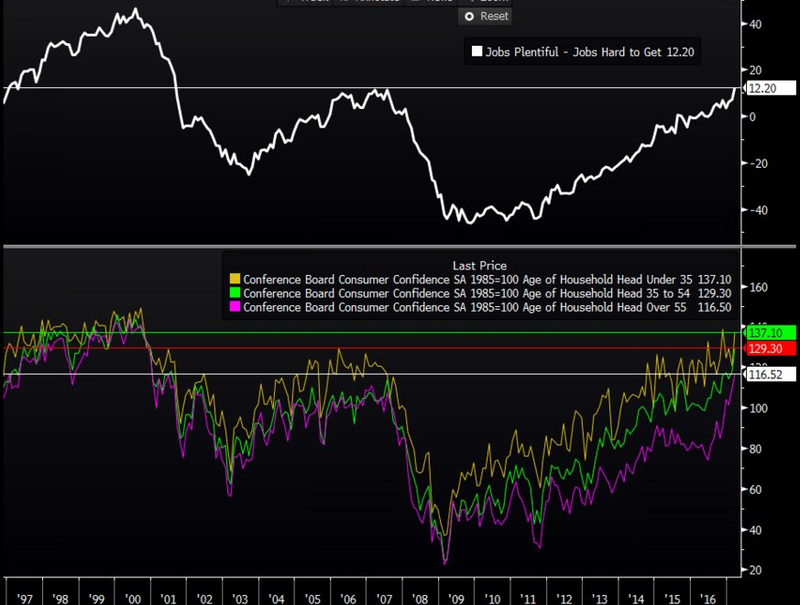 Elsewhere, the consumer confidence index from The Conference Board surged to 125.6 in March, significantly better than anticipated and the highest headline reading since December 2000. Under the hood, surveyed Americans’ general appraisal of the present situation improved considerably this month, as the percentage of consumers saying business conditions are “good” increased from 28.3 percent to 32.2 percent, and the percentage stating jobs are “plentiful” rose from 26.9 percent to 31.7 percent, a nearly 2-decade high. Forward-looking optimism has also firmed, with the percentage of consumers expecting business conditions to improve over the next six months rising from 23.9 percent to 27.1 percent in March. 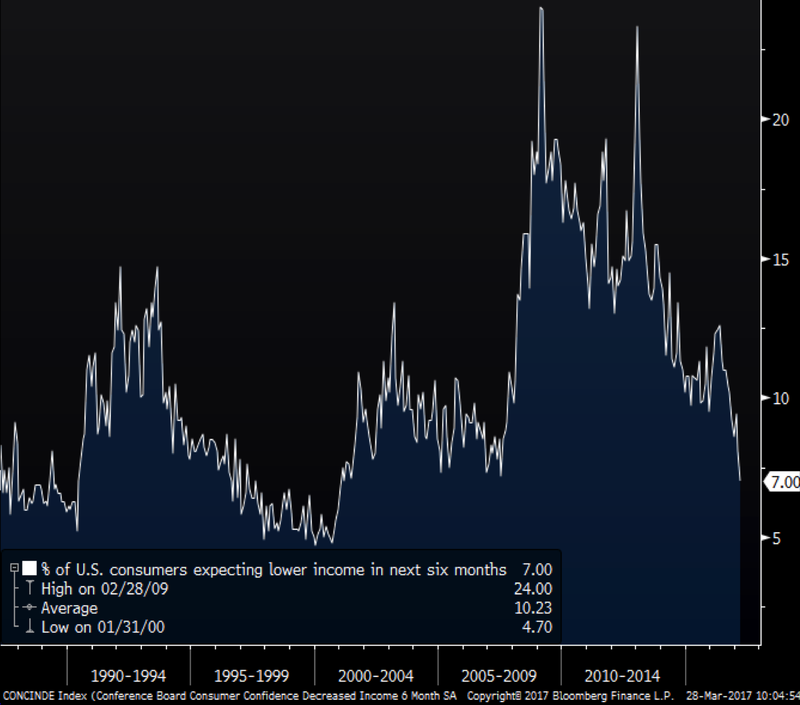 Further, consumers across all age groups reported a more upbeat outlook for the labor market this month, and the percentage of surveyed Americans expecting lower incomes in the next six months plunged to the lowest level since 2001. Despite the recent uptick in market volatility, the report also revealed that the percentage of consumers expecting higher stock values a year from now climbed in March to second-best reading on record.